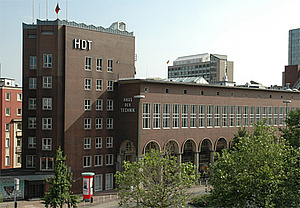 The conference will take place at Haus der Technik, wich is located at the north entrance of the Essen central railway station (Essen-Hauptbahnhof). by Rail: Essen central railway station (Essen-Hauptbahnhof), exit city "Innenstadt". via Car: From the motorway A3/A52 take the exit Essen-Zentrum/Essen-Süd; from the motorway A40, coming from the direction of Duisburg, take the exit Essen-Zentrum/Essen-Ost; and, from the motorway A40, coming from the direction of Dortmund, take the exit Essen-Huttrop. Parkhaus am Hauptbahnhof (multi-storey car-park next to the central railway station), approx. €11 per day. You can have your parking ticket validated at the HDT Customer Service Centre. Public car-parking facility at the intersection of Hollestrasse and Steeler Strasse (400 m from HDT, €6 per day on presentation of HDT registration pass). by plane: From Düsseldorf International Airport – Essen central railway station can be reached comfortably in about 25 minutes from Düsseldorf airport railway station, where about 300 trains (ICE, IC, EC and regional commuter trains) stop daily. At the airport take the SkyTrain or the shuttle bus to the airport station.